A review of several quality sites indicates that consumers like this mattress and give it fairly good ratings. Naturepedic baby crib mattresses, according to the Naturepedic site, have won many awards including an iParenting Media Award, PTPA Media Award, Mom's Best Award, and NAPPA Award. They have also been given the Creative Child Seal of Excellence and were the Top Pick for Organic Mattresses at Baby Bargains. Again according to Naturepedic, their mattresses are designed and constructed under the direction of a Board Certified Environmental Engineer, a Qualified Environmental Professional, and a Certified Hazardous Materials Manager. - Uses only 100% organic cotton (grown in the US). Cotton is natural and renewable and the organic cotton in the mattress is unbleached, undyed, and grown without synthetic pesticides, herbicides or chemical fertilizers. - 100% polyethylene food grade waterproof surface – surface has no vinyl/ PVC, phthalates, lead, or antimicrobial biocides. Polyethylene is an environmentally friendly and non-toxic plastic. Who are GREENGUARD? The GREENGUARD Environmental Institute was founded in 2001 and is an industry-independent, not-for-profit organization. They oversee programs that identify acceptable product emission standards and certify low-emitting products. To learn more you may want to check out the GREENGUARD website. The Naturepedic No Compromise Organic Cotton Classic 150 comes with a few options as well. One can choose a traditional or a seamless design, and single firmness or dual firmness. The traditional design uses the typical edge binding common on most mattresses while the seamless design uses heat sealed waterproof edges. With respect to mattress firmness, the single firmness mattress provides the same firm surface on both sides of the mattress while the dual firmness mattress has a slightly firmer side for infants and a slightly softer side for toddlers. 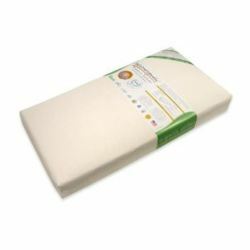 This Naturepedic crib mattress is an orthopedic innerspring mattress and it is considered “firm”. It uses a total of 150 coils and also has border rods providing strong side and edge support (note: there is also a 252 coil version of the Naturepedic classic). The mattress dimensions in inches are (L x W x H) 52 x 27.8 x 6, and it weighs in at about 28 lbs. It carries a lifetime limited warranty.